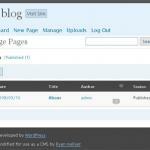 Note: Support for the Simple CMS WordPress plugin has been discontinued. If you are interested in having this product upgraded for the latest version of WordPress then please contact us for information about paid plugin development. 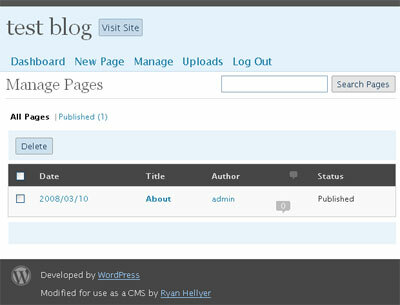 The Simple CMS WordPress plugin converts the WordPress blog tool into a basic CMS (Content Management System). Simple CMS removes all of the complicated blogging functionality which is not needed for a basic static website. This allows for easier use of the admin panel by non web designers. Note: The demo site is on an extremely slow server. The plugin will likely operate much faster and reliably on your own web host. Simply upload the folder to your plugins directory, then head to the plugins page in your WordPress admin panel and activate the plugin. If you are a “WordPress Administrator” you will not see any difference, but if you log in as a “WordPress Editor” or below, you will see a vastly simplified administration panel suitable for simple static websites. To modify the items shown in the admin menu, go to the “Simple CMS” options page in the “Settings” menu. To help with developing themes for static websites powered by WordPress, I’ve released the Simple CMS WordPress Theme (demo). The plugin doesn’t do anything exotic, the original code is still there, it is just hidden from view via CSS. Users will still be able to access the hidden areas of the admin panel if they know what they are doing. Visit the Simple CMS support board for help, advice or further information about the Simple CMS plugin. Thanks for the plug. I had considered going as far as you have with my plugin, but it was more-or-less a one-off thing I did for a client who decided not to use it, so I released it into the wild. The only thing I would recommend is to leave the Plugins menu. It’s a nit-picky thing, but even in a simple CMS, I can see where someone might want to add a plugin or two. Keith S – I might add an options page with the ability to control what people see and don’t see in the menu eventually and I’ll have an option in there for keeping the plugins page. The options page has now been added to the plugin and there is an option in there to display the plugins menu item. It would be cool, if you set up a demo site for people see withou download the plugin first. But anyway it seems really cool. Giovanni – Yeah, a demo would be nice, bt I’m not keen on opening up an administration panel to the public as I’m not sure what sort of security risks may be involved with that.